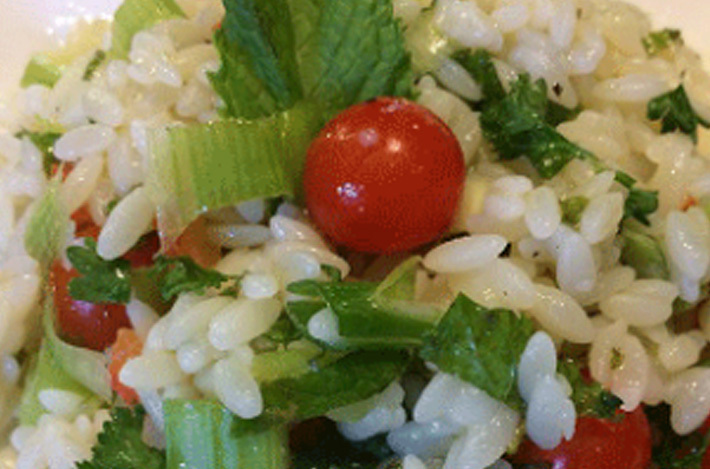 Love the burst of lemon flavor in this orzo salad. 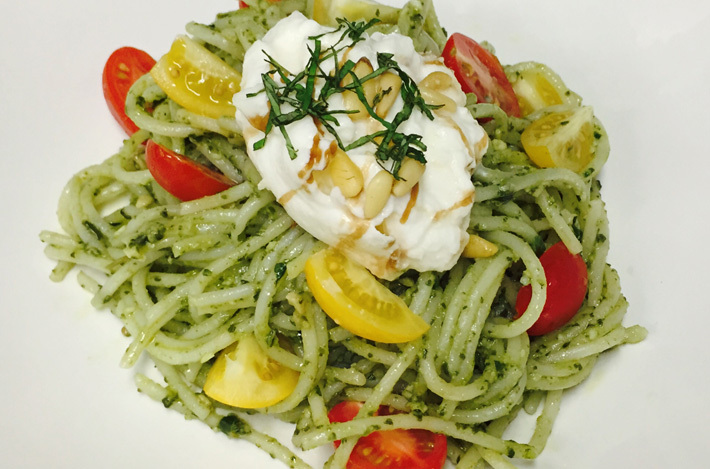 The chopped parsley and mint give a refreshing twist to this delicious salad. Can be served as a side or main dish. Andean Dream's Quinoa Orzo pasta is ideal because it's al dente texture works great with the green onions and bell pepper! We have done different variations of this salad by adding cashews and/or fresh corn kernels. Yield: 2-4 servings. Cook orzo according to directions and stir frequently. Add green onions, celery, red bell pepper, parsley, and mint to orzo mixture. In a separate bowl add olive oil, lemon juice, garlic, black pepper and sea salt. Stir well. Stir lemon juice dressing into orzo mixture. Chill and serve. Quinoa pasta mixed with bright colored vegetables, flavored with lime and garlic. 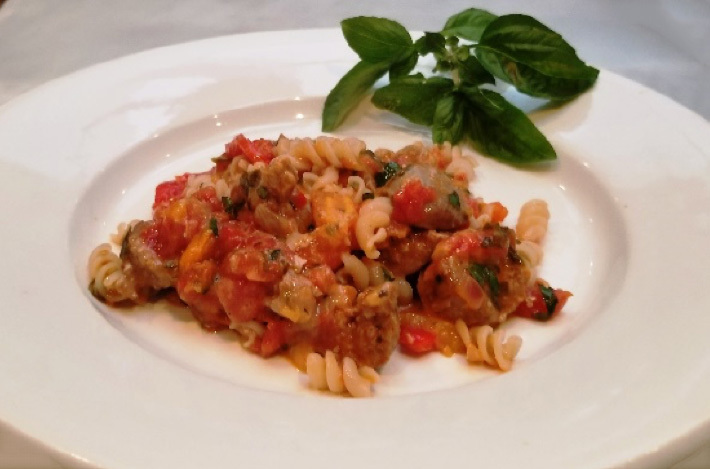 A tasty dish that will satisfy your taste buds and leave you wanting more. Combine olive oil, shitake mushrooms, garlic, shallot, salt and pepper in a mixing bowl. Mix until incorporated. In a separate bowl, mix parsley, red peppers, yellow peppers. Incorporate mushroom mixture with pepper mixture, add salt and pepper. Add cooked pasta and mix toughly. 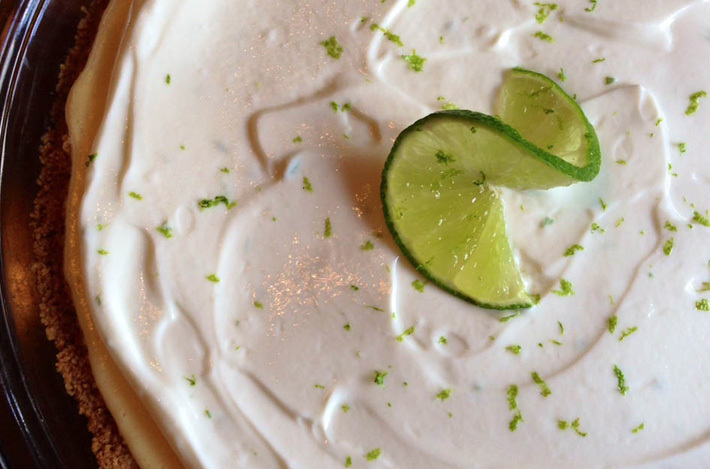 Toss truffle oil and lime juice evenly and mix all ingredients making sure all ingredients are well incorporated. 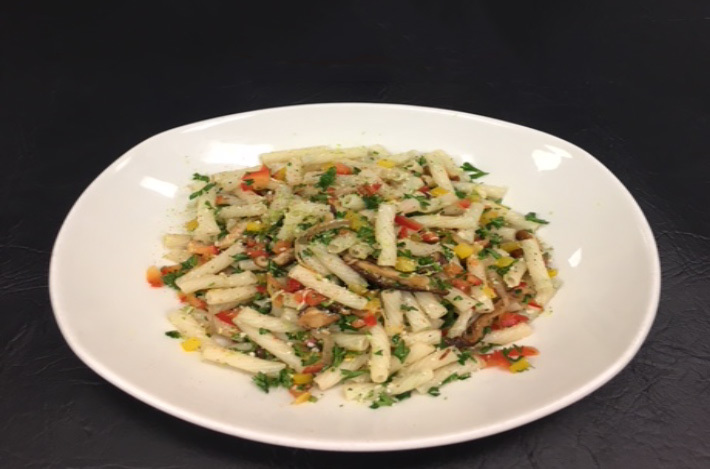 Let the pasta salad sit at room temperature for 10-15 minutes for oil and lime juice to penetrate the pasta. Place 12 oz of Andean Pasta Salad into a pasta bowl, mounted to the center of the plate. Sprinkle zesty lime and parmesan cheese around the pasta. Garnish if desired. Bring a large pot of water to a boil and salt generously, keeping in mind that you will be adding 1/2 cup of this water to the finished pasta (so don’t be too generous). Add spaghetti and set timer for 5 minutes less than the cooking time suggested on package. Warm a pastabowl. Meanwhile combine olive oil and sliced garlic in small skillet or saucepan and heat over medium-low heat until oil begins to bubble around the garlic slices. Watch garlic closely and cook until it just begins to color and smell fragrant. Remove from heat and pour oil and garlic into pasta bowl. When timer goes off add peas to pasta water. Boil for another 5 minutes. Ladle out 1/2 cup cooking water from pasta and set aside. 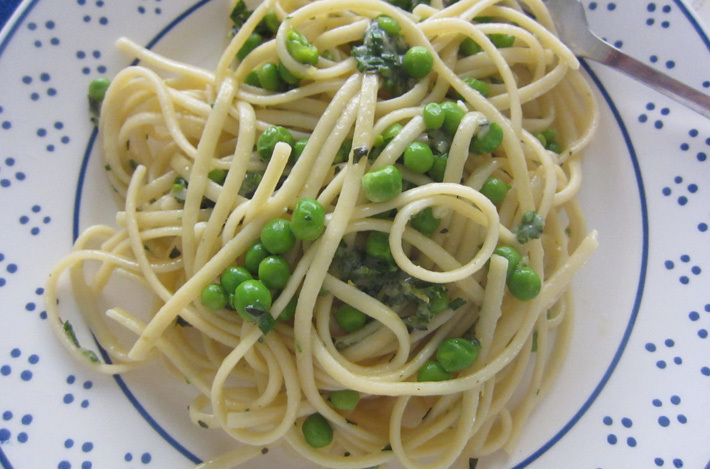 Drain pasta and peas and toss immediately in the warm pasta bowl with oil and garlic, reserved water from the pasta, herbs, Parmesan, and pepper. Serve at once. Organic, gluten free Andean Dream Quinoa Protein Fusilli pasta with sun dried tomatoes, roasted garlic, skim organic mozzarella, shredded parmesan, coconut milk, fresh chopped basil, organic chicken sausages, organic broccoli rabe, plum tomatoes, olive oil, balsamic vinegar, sea salt, pepper, with scallions & basil. Step 1. In a medium size saucepan add 8 cups of water and bring to a boil stovetop high heat (about 10 to 15 minutes for Fusilli Quinoa Pasta). Make sure you mix pasta continuously so it does not stick. Step 2. In the meantime pre-heat medium high heat a medium size sauté non-stick pan. Then punch some holes with a fork in the Italian sausages, spray some coconut oil cooking spray on the pan and sear the sausages until browned all around, approximately 3 to 4 minutes, then lower heat to low as they will need to thoroughly cook inside about 8 more minutes. Step 3. Make sure to wash/ dry dishes and clean as you go. So keep a large empty bowl on the counter next to you for garbage then dump into main garbage. Always leave your counter/prep space clean. Step 4. When the water has reached boiling add a splash of olive oil and a pinch of sea salt then the whole box of the Andean Dream Quinoa Fusilli Pasta and stir periodically for 10 to 15 minutes till done or al dente. Make sure you keep checking it so it does not OVERCOOK by testing one piece with a fork! Step 5. Add 6 cups pf water to your second medium size sauce pan and bring to a boil, then add the washed broccoli rabe and cook for 3 minutes, drain the water and place in a serving bowl add a drizzle of olive oil, sea salt and black pepper, mix well add a squeeze of lemon, mix again. Step 6. Dice all your plum tomatoes, peppers and the scallions and place in a small bowl, add a drizzle of olive oil, a pinch of sea salt and pepper and fresh chopped basil ¼ cup, a squeeze of lemon too, mix well and set aside. Step 7. Rinse and dry any dishes and put them away, then check your pasta and stir it as it should almost be ready. If the fork goes through it easily when you check it and taste it to make sure it’s not too hard or soft. Step 8. When the pasta is ready drain it and pour into the non-stick copper sauté pan and add the coconut milk with fresh chopped basil, sundried tomatoes, minced garlic, chopped peppers, sea salt and pepper mix well and cover. Step 9. In the meantime, remove the dirty pans rinse and wash quickly including any dishes, utensils and knives and cutting boards make sure you dry and put them all away. Step 10. Finish by adding the whole package of the mozzarella and parmesan shredded cheese to the cooked quinoa fusilli pasta mix well and eat! Place your empty saucepan in the sink and soak with hot water and soap wash quickly, dry it and VOILA! 4 dishes in less the 30 minutes and a spotless kitchen again! Season with salt and pepper. Seasoning will be based on the salt in vegetable stock or broth used. 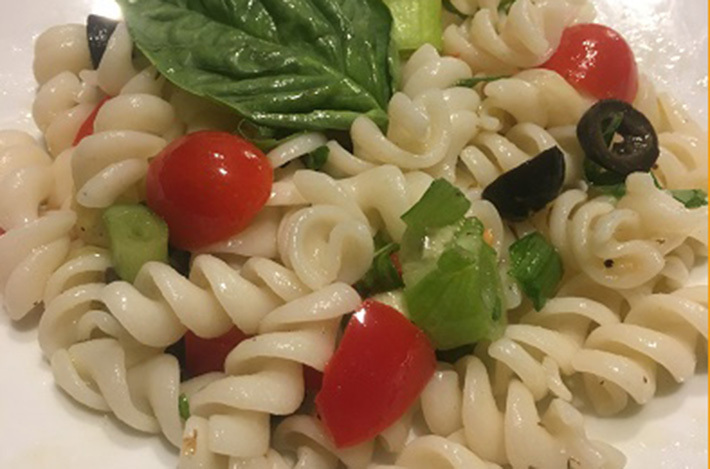 Love eating this pasta salad alone or on top of a fresh garden salad. This refreshing salad can last up to a week in the refrigerator. Cook pasta according to directions. Rinse with cold water and set aside in large bowl. Add bell pepper, tomatoes, green onions, olives and basil to pasta and stir gently. We love tossing this pasta salad with fresh pine nuts or cashews. 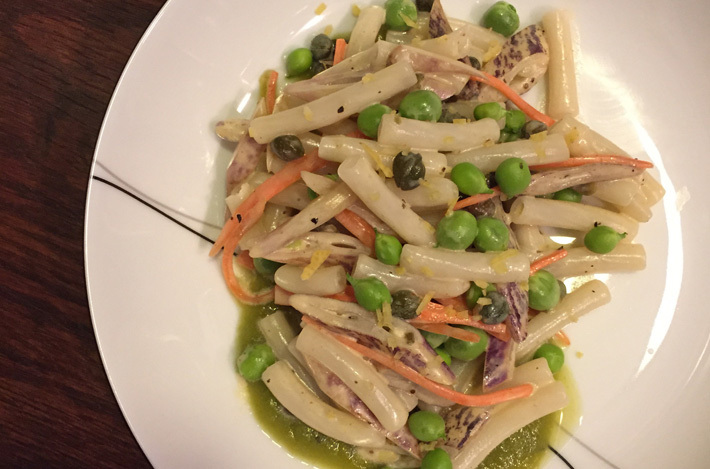 To Assemble Salad: In a large mixing bowl add cooked and cooled macaroni, the shelled snap peas, sliced dragon beans, capers, and carrots. Next add the dressing then toss until everything is evenly distributed. Plating: Put 1 1/2 Tbsp of the pea purée on a plate then spoon about 1 cup of the macaroni salad on top. Garnish with fresh lemon zest. Blend until smooth. Use your judgement on this purée. 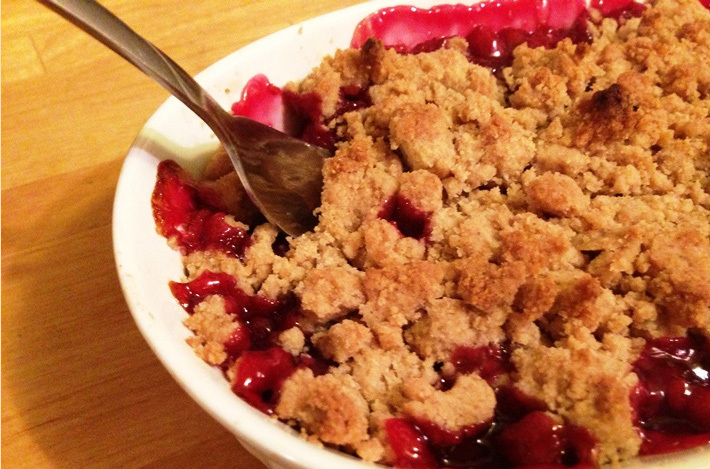 It's very easy to make this delicious! In a large bowl, place the cherries, lemon zest, orange juice and honey. Gently mix with a spoon. Then add the tapioca flour and gently mix. In a separate bowl add the Andean Dream cookies and the melted butter and mix. Place the cherry mixture in soufflé dishes (4 oz. dishes). Fill about 1 inch from the top then sprinkle about 2 tablespoons of the cookie mixture on top. Bake for 25 minutes. Once your cashews have been soaking overnight, rinse them in a colander. Place the cashews in a blender with the lime juice, agave, basil leaves, zest and nutmeg. Process until very smooth. You may help yourself with a spatula. It is important the mixture is not grainy. Place the cookie crust on the ring mold and press it down as hard as you can. Pour onto the crust the lime and cashew mixture. Place covered in the refrigerator and allow to set approximately 5 hours. Serve with mixed berries, mango or pineapple.